Even with a near miss by Hurricane Odile it seems this year’s monsoon season has brought bountiful gifts to the Sonoran Desert. 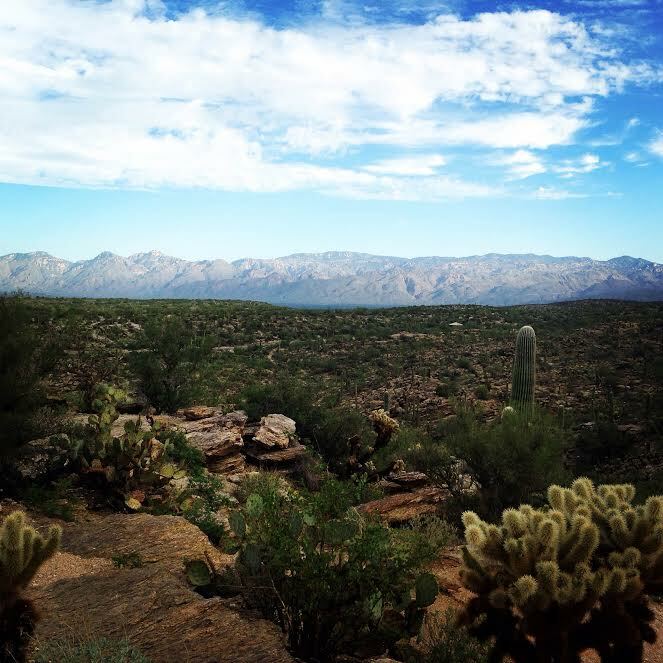 This past weekend I ventured into Saguaro National Park and up Tanque Verde Ridge to gain a 360 degree view of the lush desert basin. Although the summers can be harsh in the desert, the rainy season makes it worth while. If you happen to be in the Tucson area in the Fall, Winter, or Spring I highly suggest this scenic (yet mildly strenuous) hike. Let’s just say that you earn your views and it is definitely worth every step. Although I only had time to make it up to Juniper Basin this time around, I hope to hit Manning Camp after the weather begins a its cooling trend. 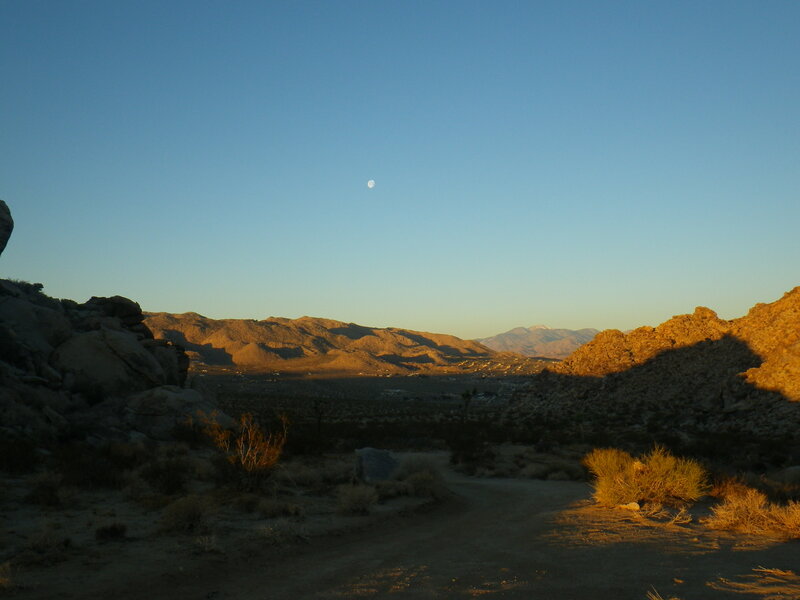 Check out this fantastic hike description provided by Todd’s Desert Hiking Guide. From downtown Tucson follow Speedway Blvd. East bound to Houghton Road. Turn right and go 3 miles to Old Spanish Trail then continue another 2.8 miles to the entrance of Saguaro National Park. Stop at the toll booth to support your National Park ($10 for a week pass or $80 for a yearly pass good at any National Park for $80). After passing the toll booth, turn right and head towards Javelina picnic area. The trailhead is located near the start of the loop. Pack enough water for yourself for the day (and maybe a little extra). As I mentioned, the trail can be strenuous and you won’t find a water supply along the way. This week’s photo was shot from Joshua Tree National Park, a place I have grown quite fond of over the past several months. Blisters are a pain, literally. As biped adventurers our feet take a lot of abuse from repetitive impact across miles of uneven terrain, scaling large rock walls, scrambling up peaks, so on and so forth. While our tired “dogs” often become achy and sore, the most common foot problem in the backcountry is a blister. Often created by friction, pressure, ill-fitting boots and wet socks, there are a few steps we can take to not only treat a newly formed blister but possibly prevent them as well. The best prevention for blisters is to wear boots that fit with room to wiggle your toes and without slippage in the heel box. Just like your clothing, avoid cotton! Wear wool or synthetic socks that will wick away moisture. Take the extra time to break-in your new boots. 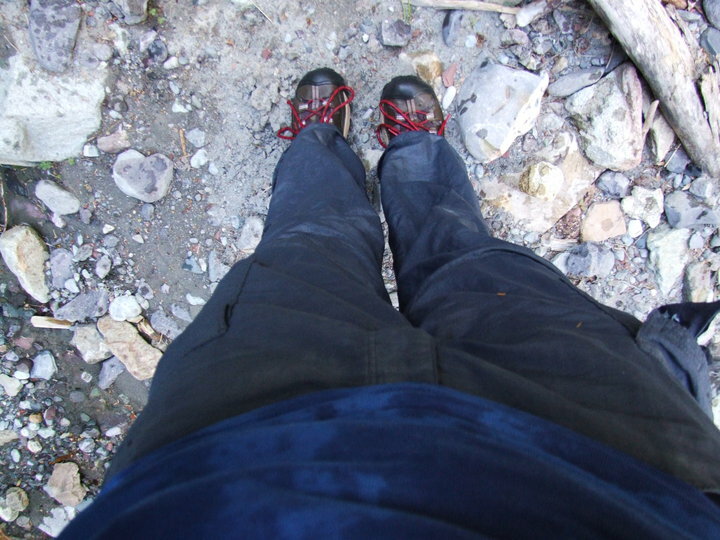 Wearing your new kicks around the house and on day hikes before hitting the trail for a multi-day excursion will save your feet from unnecessary pain. As soon as you feel a burning sensation, or hot spot, cover the spot with moleskin or duct tape. If you have to pop a blister to relieve pressure do with a sterilized needle or razor blade. The best method is to clean the area then pierce the top or roof of the blister with a sterile needle and gently massage out the fluid. Be sure to keep the roof intact as a protective layer to the skin beneath the now dead layer. Create a donut out of a piece of moleskin or foam that is just larger than the blister then apply antibiotic ointment and dry the skin around the blister. Once the area is prepared, affix the moleskin donut so that the hole creates a pressure free pocket around the blister. You may then apply a second donut as needed to help take away any direct pressure. Seal this second layer with yet another layer of moleskin and cover with duct or athletic tape. Keep a bandage in place for up to 3 days, then wash and re-tape. If the area is red, swollen, or leaking pus, it’s infected. Keep it dressed and if the infection persists for more than a few days, see a doctor. What special methods for prevention and treatment have you learned from your time on the trail? 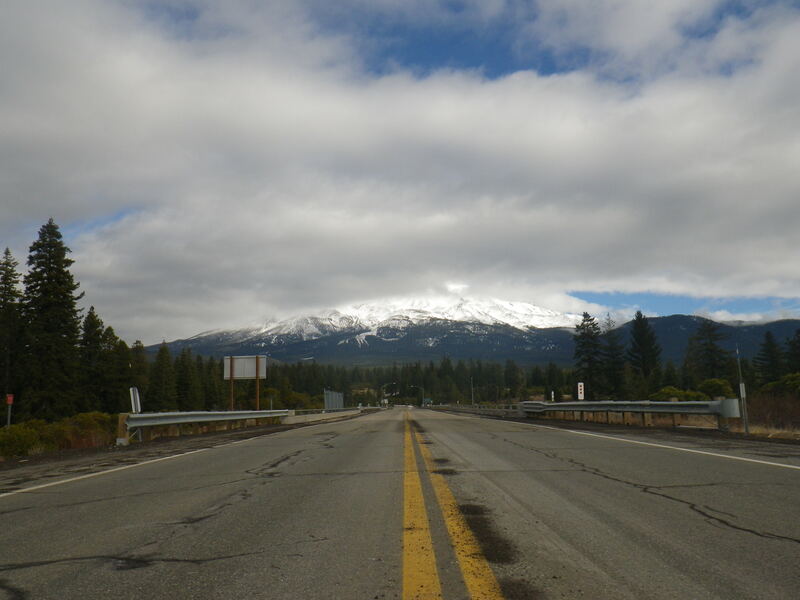 I took a break from the non-stop travel down I-5 earlier this week to catch a vague glimpse of Mount Shasta from the west side. Like most outdoor fanatics I scrimp, save, and scan Gear Trade or other sale sites for the backpacking tent I have been drooling over for the past six months (or more). Backpacking tents are one of the largest investments that any avid backpacker or climber will make. Taking time to give your new investment some TLC after every trip will help to ensure a number of comfortable evenings for many trips to come. One of the top priorities in tent care is properly cleaning and storing it after each trip. Not only will this prolong the tent’s life, you will also avoid that disgusting smell of mildew next time to you go set up camp ten miles in. Shake out loose dirt, clean off any mud, wipe down the floor, and fly with a sponge and water when you return home from every trip. Make sure the tent and fly are also both dry (avoid direct sunlight) before packing it away. If you live in a humid environment consider storing your tent loosely in a stuff sack or box to avoid mildew. Mildew will kill a tent and your sense of smell. This fungus will penetrate the urethane coasting of the tent fabric and grow between the fabric and coating eventually lifting the coating from the fabric thus loosing all waterproof capabilities. Should mildew begin to form you can sponge-wipe the tent with a solution made up of 1/2 cup Lysol to a gallon of hot water, or rinse with a solution of 1 cup of lemon juice and 1 cup of salt to a gallon of hot water. Most of the problems experienced with tent zippers are due to wear in the zipper sliders, rather than a failure of the coil itself. (The slider is the metal part that you move to zip and unzip the zipper.) Particles of dirt and grit on the coil, accumulated during use, abrade the mechanism inside the slider head. Once a slider becomes worn it will stop engaging the teeth of the coil correctly and cause the zipper to slide out-of-place. Avoid accelerated wear and tear by cleaning the zipper coils after every trip, especially in sandy and gritting environments. Zipper cleaners and lube are available at most outdoor stores, or you can use paraffin wax or lip balm if you’re in a pinch. Petroleum based lubricants are not recommended. One of the biggest causes of tent damage comes from the sun. UV damage will cause nylon and polyester to become brittle and eventually tear. When traveling in dry and sunny environments try to set up your tent in the shade whenever possible. Consider using the rain fly even on clear days as it acts as a sunscreen for the tent and is less expensive to replace if it is damaged. 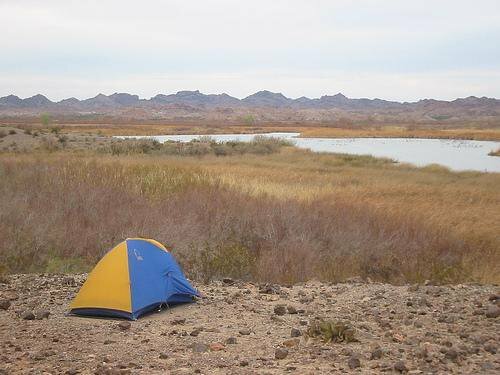 Tents are made from a variety of materials so it is difficult to say what substance will or will not damage your tent. You are best to start with only a small spot on the tent and with substances that are less likely to do any damage to begin with. Some die-hard backpackers swear by butter or vegetable oil rubbed into the area with a paper or cloth. Unless you enjoy the midnight invasion of woodland creatures licking your face or attempting to tear down your tent, make sure to immediately follow this method with soap and water to remove any oil and residual smell. The car was packed, dog loaded and tentative plans mapped out yet the reality of my newfound vagabond lifestyle had still not sunk in. Headed for Phoenix, I was making a brief stop to pick up Doug, my partner in adventure for the next couple of weeks. As I pulled up to the front door, nerves sank in. Not only was I headed into the unknown and open road, but I was about to embark upon it with the added pressure of being with another person 24 hours a day. Being a fiercely independent person, I began to wonder what the next two weeks would bring; I wondered if I would be able to break through, or at least muffle, the stubborn streak that plagues much of my life. I even pictured one of us ending up on the side of the road with bags in hand and thumb high in the air. Yet before I could give it another thought, we were loaded up, dog crammed in with our ridiculous amounts of camping gear, and headed to New Mexico. After spending our first night in the warmth of southeast Arizona, we arrived in the Gila Wilderness after driving 40 miles down a winding, desolate, two-lane road dodging ice patches and hurried drivers. The sun had set hours before our arrival and temperatures quickly began to drop into the teens. When we originally started this tour, we accepted that the temperatures would be cold, but the aptly deemed “Arctic Blast” that was sweeping the nation had never been a consideration. It felt as if my body froze instantaneously after arriving at our campsite for the evening. Starving, we quickly set up camp and I proudly pulled out my hand-me-down Coleman stove, deemed my “super stove.” I was anxious to cook my first meal on this single burner and grill combo. As I fumbled to assemble the stove with frozen fingers I began to realize something was missing. Taking inventory once more, I began to realize the connection from propane to stove was missing. Both in denial, Doug and I scoured the box it came in; we checked the car and after much frustration, finally accepted the fact that we were relegated to using our less powerful backpacking stoves. Shaking off my frustration, I went back to preparing dinner and grabbed a bottle of water only to realize that it had already began to freeze after pouring it into the pot. Hungry, cold, and tired, I began to wonder what I had gotten myself into; maybe I should have listened to the smarter people in my life and waited for spring. Dinner was devoured quicker than it was made and I was off to bed in hopes of sleeping off the evening’s events. I curled up in the tent with Sienna; she shivered through the night and my face began to freeze as temperatures dipped into single digits. Morning light could not come soon enough and even as the sun rose over the surrounding cliffs, the little doubtful voice continued to fill my thoughts. It’s difficult to get up before the sun when you lose all feeling in your face overnight. After Doug slept in much later than expected, he got up and prepared coffee. The campground was relatively empty of campers, and day-use visitors drove by us in their warm minivans and sedans looking at us as if we were sideshow freaks, crazy for camping in the bitter cold. 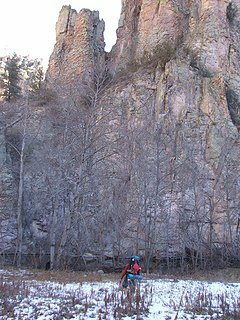 Yet even with the brisk evening, we remained hopeful that our plan to bring in the New Year from the backcountry of the Gila Wilderness next to Jordan Hot Spring was within reach. As we prepared our bags, my spirits lifted, or maybe it was just the coffee buzz. Either way, we were on the trail and headed out around noon on New Years Eve. It was not until close to four miles in that we once again faced with a challenge. 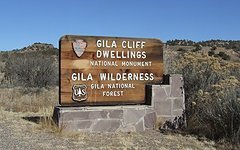 A challenge that made me realize why the visitor’s center attendant at the Gila cliff dwellings looked at us as if we were crazy when we mentioned that we were heading to the hot spring for the night. Sure, six miles into the backcountry is not so bad; 15 river crossings are also not so bad; but when it’s 20 degrees outside, and the river is too wide to cross without getting your feet wet, it gets to be pretty bad. We had a mere two miles left after already traveling a solid four miles; how badly did we really want to spend New Year’s Eve by this elusive hot spring? Not wanting to be the one to give up, we egged each other on like two grade school children, about how far we would actually go. Warm hiking boots removed, pant legs rolled up, we finished the last two miles in flip-flops, walking across packed snow and through freezing water. By the sixth crossing my feet began to turn bright red. All I though about was the hot spring, and hoped that it actually existed. Each step sent pins and needles up on my legs. I stumbled over algae-covered rocks in the river as Sienna bounded past me with ease. After what felt like a number of miles, the evening’s darkness began to fall, and that not-so-sweet smell of Sulfur filled the air. I wondered if I was starting to hallucinate, or if we really made it. I could see Doug smiling up ahead and I began to believe it was going to be a great New Year’s Eve after all. Not only had we made it to our destination, we somehow did so while working as a team and without too much complaining in the process. I wearily threw my backpack to the ground and we pitched our shelter in record time. Stillness blanketed the valley and cliff walls around us. The cold set in, yet somehow the sweet victory of our trek made it not so bitter. (Or it could have been the celebratory champagne flowing into our classy enamel ware cups.) We made it in one piece with smiles and humor still intact. Now all we had to do was hike back. 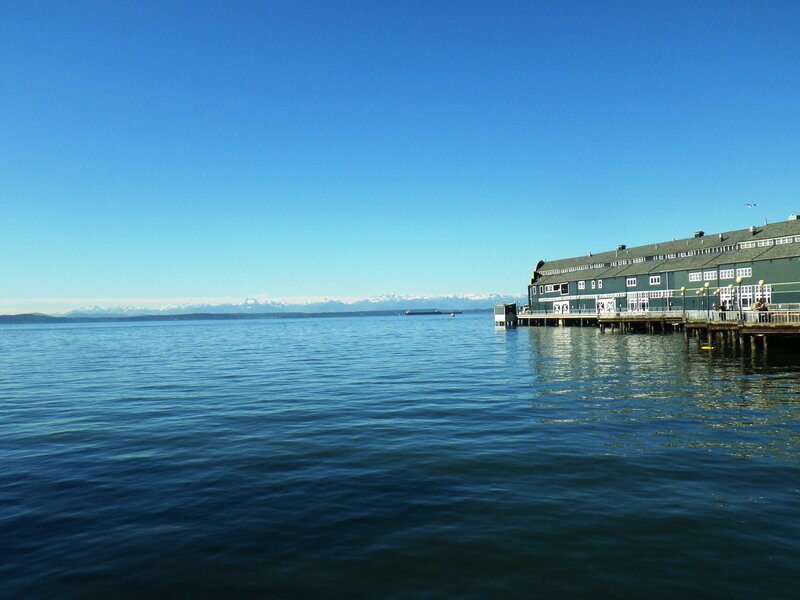 Attempting to make the most out of my brief tour into Seattle, I ditched my mobile home for the day and rode the train. The day was unseasonably pleasant with clear skies and warm sun leaving the Olympic Mountains visible from just about anywhere I ventured. This past week has been a complete whirlwind for many reasons, but this week’s Sunday Photo is a moment of peaceful beauty that resonated within my soul.